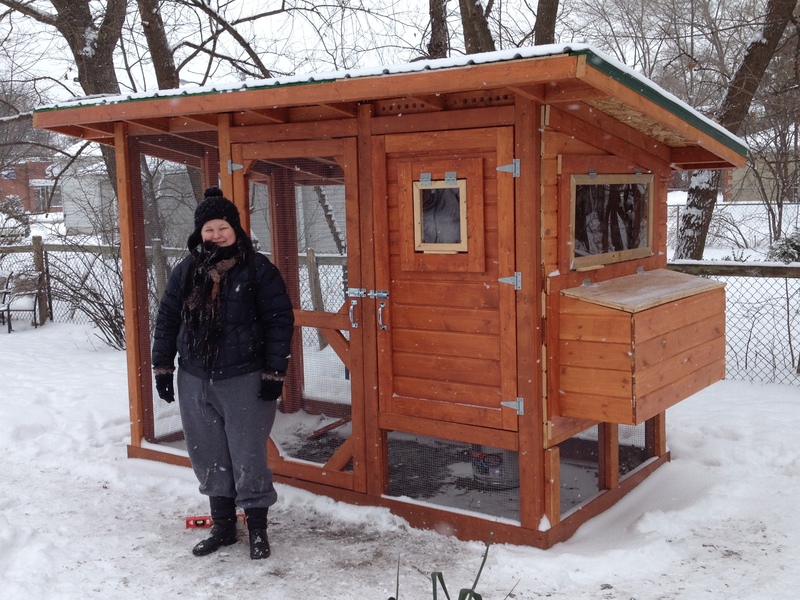 Jilli and her (almost) finished chicken coop. 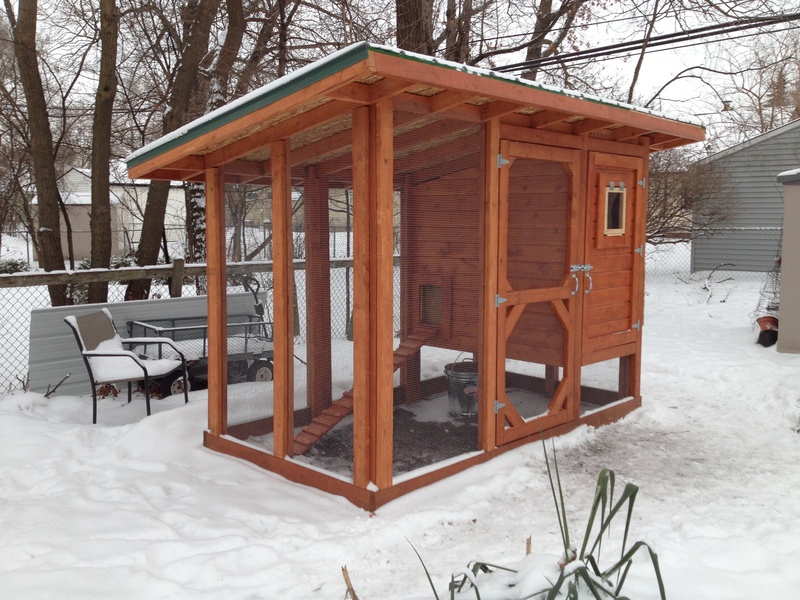 After two days of work in the wind, snow and sub-zero temperatures, we are about 95 percent complete with the coop. Our friend Eric showed up Saturday afternoon with pre-cut window frame pieces and a Tupperware container filled with lemon cupcakes (a gift from his wife Char). After settling in, and eating some shepard’s pie for dinner, we got down to business. Eric lines up the window pieces before bracing it. 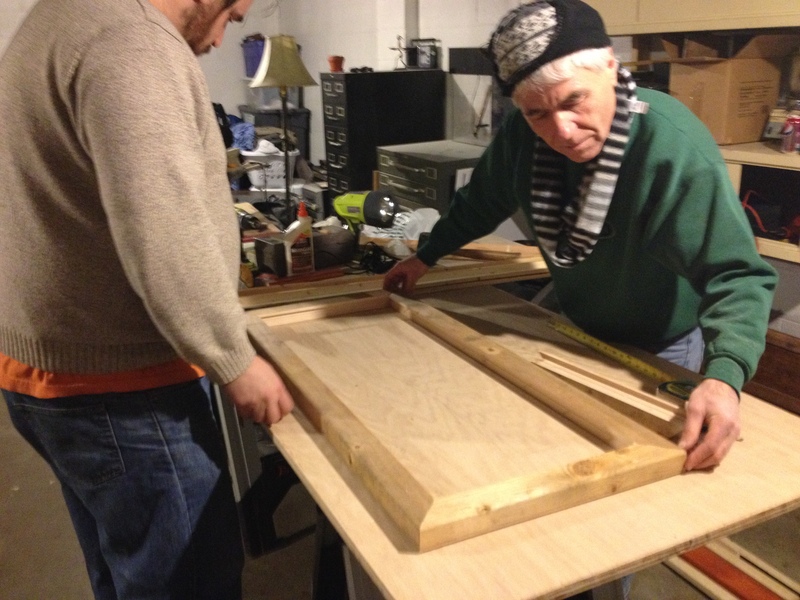 We still needed plexiglass for the windows, so Eric and Matt ran up to Home Depot. Then we went into the basement to get started. 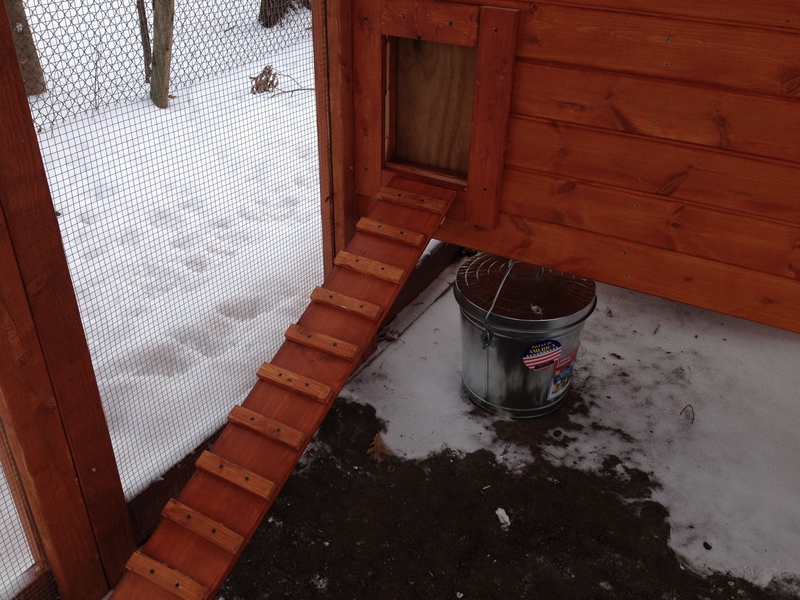 Eric had built a sliding guillotine door and braces for the chicken door into the run. It was ready to go and just needed to be installed. Eric braces the small window. So we focused on cutting the window frame wood pieces to size. Eric measured twice, Matt cut once. Then Eric held up one piece and quizzically stared at it. “Is it too short?” Matt asked. Eric had only brought exactly the right amount of wood we needed, so there was no room for error. “Is it the right length?” Matt demanded. The dramatic pause continued to build. “Pretty much, almost, exactly,” Eric said, with a smile. 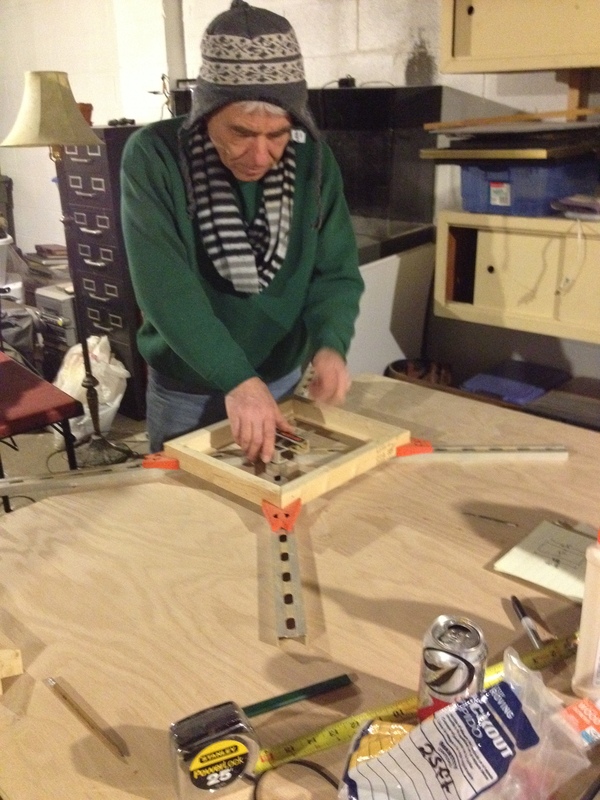 We glued the ends and placed them together, using a frame clamp. Those needed to set as long as possible. After they were clamped, we added corner braces, then shifted to the plexiglass. After measuring the openings, Matt scored the plexiglass then we snapped off the excess pieces. It worked well except for the small window that had just a small amount of extra. Since we couldn’t really get a grip on such a small strip of plexiglass, I suggested that we use pliers to snap of the pieces. It worked like a charm. 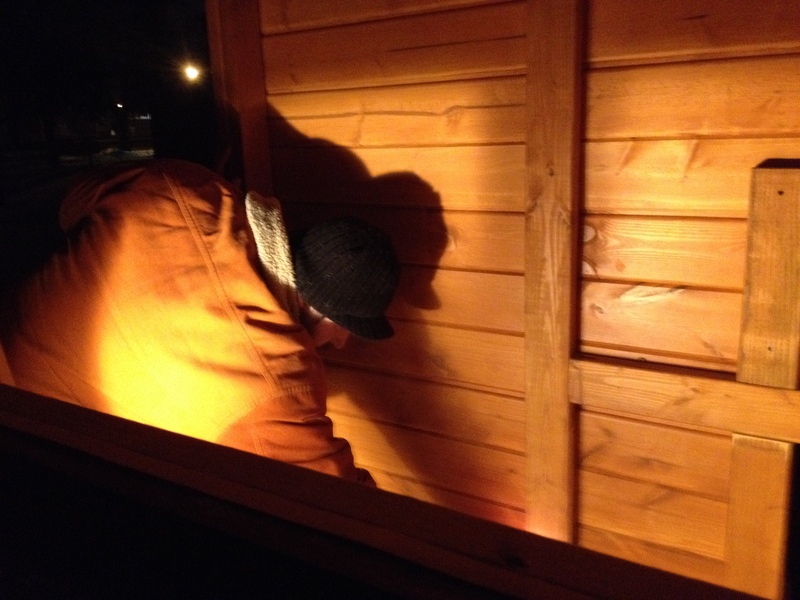 We also worked outside at night. This morning we finished constructing the windows, then took them out into the cold to install. The small window for the hen house door ended up being about a half-inch short. We will fix that by adding a backstop to cover the gap. Both windows went in easily. We still need to add wire mesh to the back openings of the windows (to prevent both escapee chickens and predators from entering the coop) and additional framing. We also installed the guillotine door and the ramp that leads into the little chicken door on the hen house. Adding the ramp seemed to bring the project full circle. I can already imagine our chickens walking up and down the plank. I’m also excited about it because I built the ramp all on my own. A view of the ramp leading up to the chicken door. We will attach a string to the top of the sliding door so we can lift and lower it every day. The inspection is at 10 a.m. Wednesday. I found out from a local chickeneer that if I pass, I most likely will receive a rough approval, and that the inspector will return once I have chicks to make sure I only have three (the limit in Ferndale) and no roosters. I just trudged out in the snow again to marvel at our work. I’m amazed at what Matt and I accomplished, of course with the help of a couple great friends. We had no construction skills and a vision. Is it what we hoped for? It’s so cold in the D! 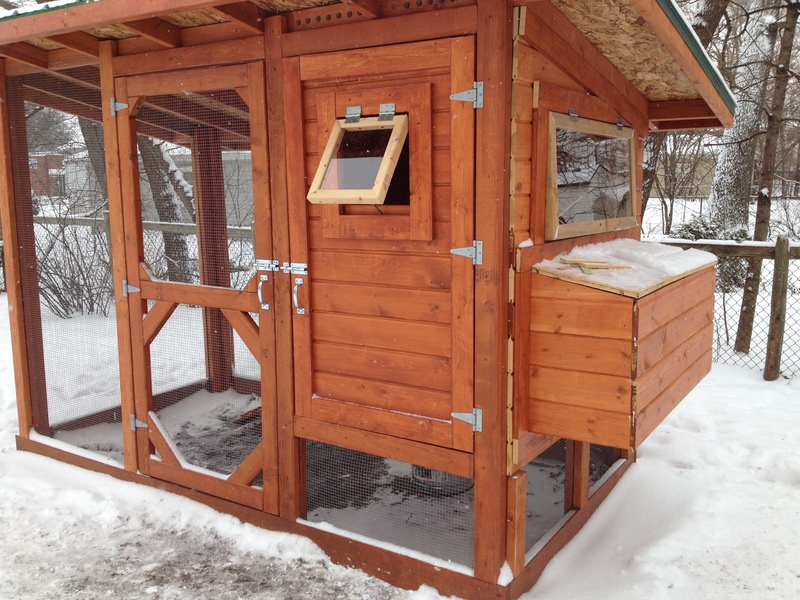 Extra points to you for finishing up the coop in the most extreme of conditions. Looks great! Thanks so much! We’re definitely looking forward to the big thaw! It looks great! Will they stay inside all the time? I am looking for ways to keep 2-3 chickens inside a coop all the time.. Thank you! The chicks will mostly live in the coop, but when we are home, we plan to let them roam the yard. We will have three chicks. The coop is designed to handle up to six.